Published Jun 22, 2016 by Cisco Press. Part of the LiveLessons series. More than 4 hours of video training covering everything you need to know to design, configure, and troubleshoot Cisco ASA Firepower services. Learn how Cisco Advanced Malware Protection (AMP) capabilities have been integrated into the Cisco ASA with FirePOWER Services and Firepower Threat Defense. 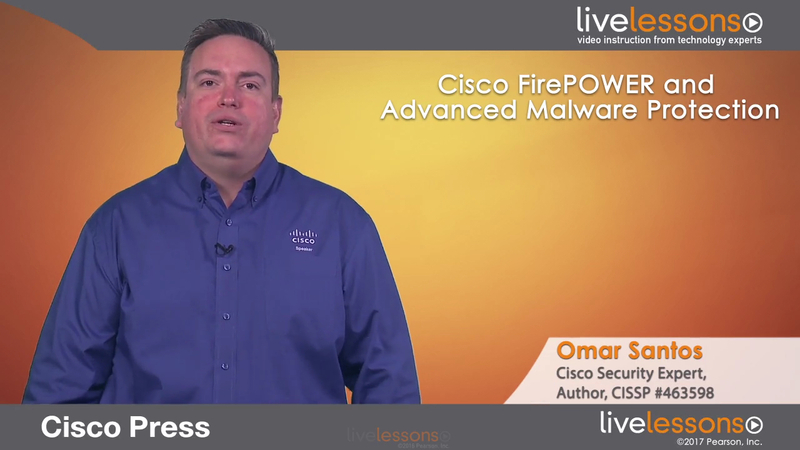 Cisco Firepower and Advanced Malware Protection LiveLessons walks you through the steps for designing, configuring, and troubleshooting Cisco ASA Firepower services so you can implement latest threat detection services from Cisco. Omar Santos, best-selling author of CCNA Security Cert Guide and Complete Video Course and a principal engineer of the Cisco Product Security Incident Response Team (PSIRT), provides step-by-step coverage of the new Cisco Firepower services and explores the Cisco Next-Generation IPS appliances, Cisco ASA with Firepower services, AMP for networks, endpoints and content security, and Firepower Management Center. This video course serves as comprehensive guide for any network and/or security professional who has deployed or is planning to deploy Cisco Next-Generation Security products, including the Cisco ASA with FirePOWER services, Cisco Firepower Threat Defense, Cisco AMP for Networks and Endpoints, and the Cisco Firepower Next-Generation IPS appliances. Any security professional who manages or configures the Cisco Web Security Appliance (WSA) and Cisco Email Security Appliance (ESA) with the new Advanced Malware Protection (AMP) solution will also benefit from this video course. * Streaming—Watch instantly as the video streams online in real time; after purchase, simply click Watch Now to get started. * Download—Download video files for offline viewing anytime, anywhere; after purchase, simply click the Download icon within the player and follow the prompts.